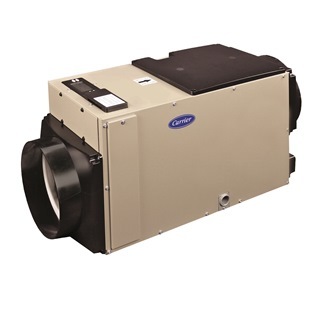 The Carrier® Performance series dehumidifier is available in two sizes so regardless if you need a whole-home solution or just have a humid basement, you'll have dehumidification that's just right for your needs. Both sizes work quietly to wring out humidity from the air so you can save on utilities and be comfortable. And, they're designed to be configurable with your existing system in a multitude of ways or operate independently away from your system if space is a problem.